Now that Wendy-kins can read, she's enjoying all kinds of poems and stories! 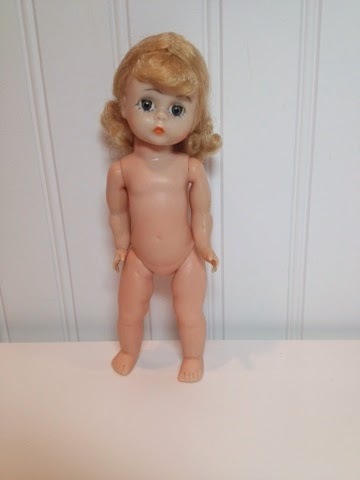 As I mentioned in my last post, I've been working on a large lot of 8 inch dolls from the 1950s to the 60s. Two from the lot are Alexander-kins, or Wendy-kins, and there was also a headless Alexander-kins body. There is also a lot of clothing, none tagged, but almost all are clearly Alexander pieces. They have the square snaps and detail and the recognizable lace. I was able to identify the Mexico dress and skirt from 1965. 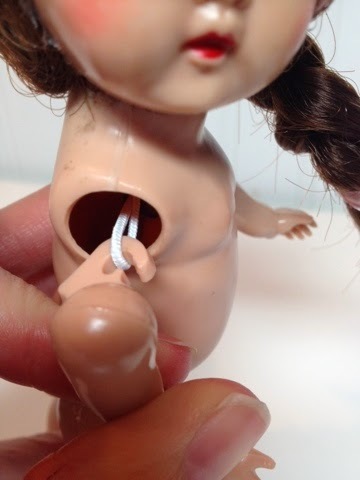 This doll has pierced ears. When cleaning and styling the first Alex doll I saw her wig was styled with a curl on her forehead, and I immediately heard my grandmother reciting the Longfellow poem above. Whenever my sisters or I had our hair in curls Grandma would say, "When she was good she was very good indeed, but when she was bad she was horrid!" It's funny how these perfectly clear memories surface out of nowhere, swimming up from the past into the present. I decided this doll had to become a literary doll! Her face has faded so it's slightly lighter than her body. The doll is a bent-knee strung doll, not a walker. 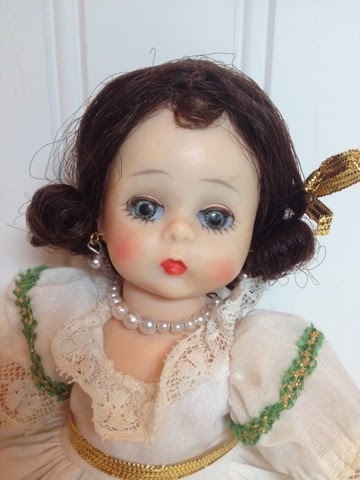 The Girl with the Curl has pierced ears, so I assume she was originally an international doll, but I haven't been able to identify her. I dressed her in the Mexico dress and an Alexander slip. I gave her a metallic gold sash and hair ribbon. I re-soled the vintage black shoes and gave her old rayon socks and underpants. 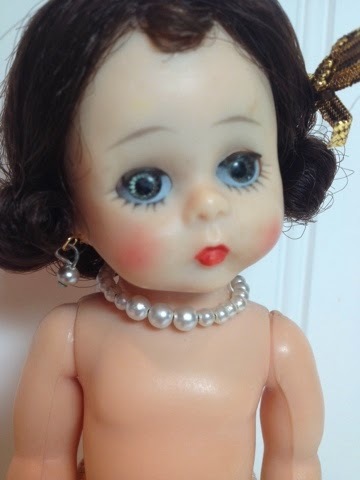 Girl wears a vintage graduated "pearl" necklace. I made her "pearl" earrings by hanging the vintage pearls on new gold-plated posts so they won't discolor her ears. When she's being "very good indeed" the Girl can have an ice cream cone, and she holds it now. 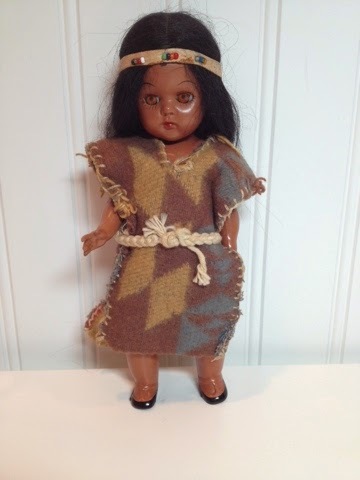 The doll wears the "Mexico" dress from 1965. Since I was on a literary trend, I decided the blond Alexander-kins had to be Heidi. This Alexander-kins has unusually long hair with tight curls at the ends. There is a lot of glue in her wig and hair, though. 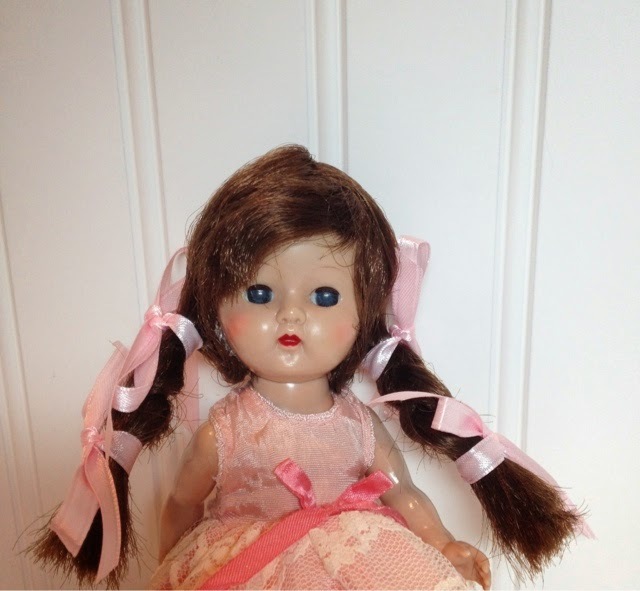 To hide it I styled her hair in curly pigtails and pinned them all along the nape of her neck. I gave her two hair ribbons as well. 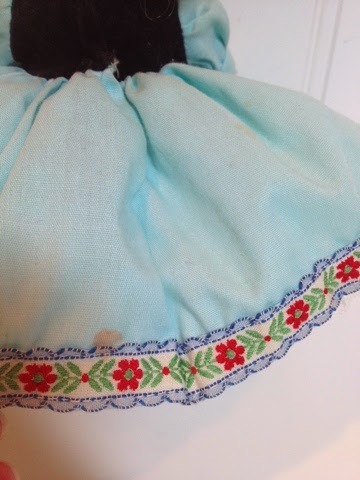 The doll clothing lot contained an Alpine sort of dress. This is clearly an Alexander piece, but only a tiny bit of the tag remains so I can't tell which one. I'm pretty sure it's the "Romania" dress though. I gave Heidi knee socks and Alexander pantaloons. These were both worn by the headless Alex doll in the lot, so I'm confident in identifying them as Alexander. There were two slips in the lot, identical except that one is crisp and new-looking. I gave the new-looking one to Heidi. 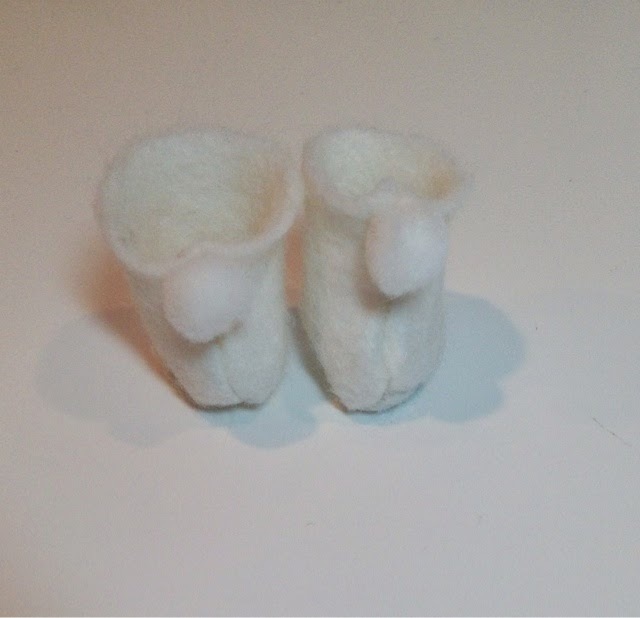 I made little white wool felt boots with pom-poms for Heidi, too. I made these boots from wool felt. Grandfather carved a little toy goat for Heidi, and she loves to play with it (really, the goat is hard plastic). I added a very nice vintage hard cover edition of Heidi to the lot. 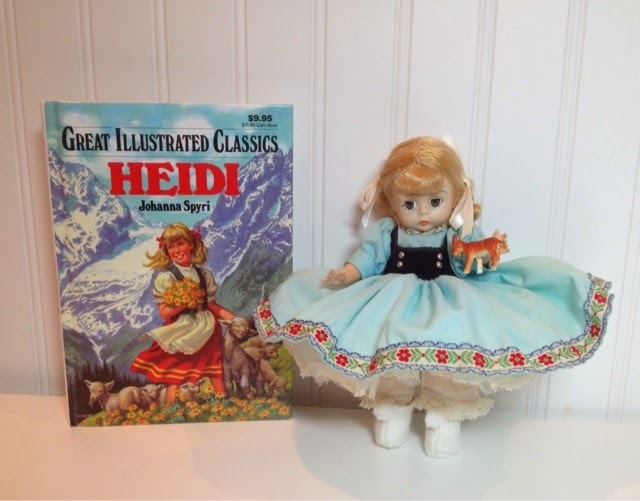 As I've mentioned before in this blog, Heidi was one of my favorite childhood books. My father died when I was three and I went to live with my grandparents and spent most of my time with my Norwegian-American grandfather, eating lots of cheese, working in the garden, running wild. So, I can relate to the book! As long as I stayed in the neighborhood my grandfather allowed me to go wherever I wanted, even to the lake! I hope a new little girl out there can enjoy this book as I did, and that she's actually able to play with the doll. I wasn't ever supposed to play with my Alexander-kins! 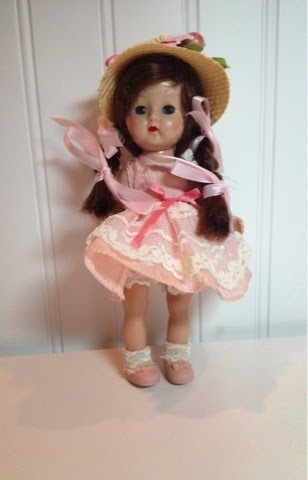 Alexander-kins are one name used for Madame Alexander's small Ginny-sized dolls. The FAO Schwartz catalogue listed her as "Wendy, Madame Alexander's new miniature doll" with a trousseau in their 1953 catalogue. 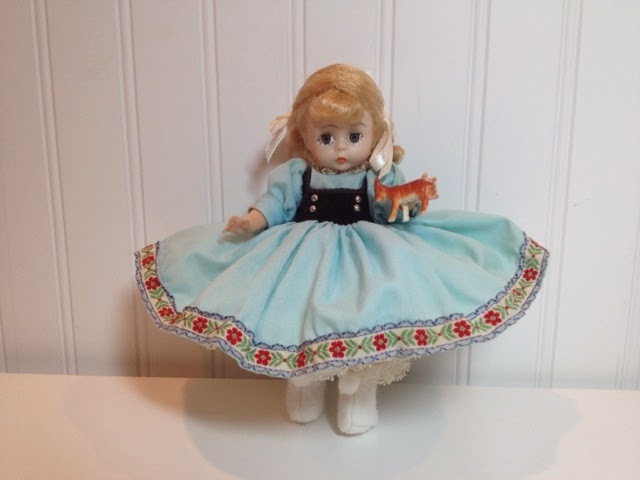 The same catalogue lists a "Wendy-Ann Trousseau" in 1955, and the doll pictured is the same blond Alexander-kins. There were also "Quiz-kins" and a "Wendy-kin Baby" with molded hair. So, it's confusing! The reason Wendy and Wendy-Ann were popular names with the Alexander company is Beatrice Alexander's granddaughter was named Wendy Ann. When Wendy Ann died tragically in a car accident at only about 20 years of age, the company dropped the "Ann" and just used the name Wendy from then on. The face mold changed from the 1960s to the70s. It's easy to see why the Alexander-kins, whatever you call them, were popular. The small size is attractive to little girls, and the price was attractive to parents. A Wendy-kins trousseau with a doll, trunk, and assortment of clothing, sold for $12.95 in 1953 and 1955, whereas, a Cissy trousseau with a trunk was $55 in 1956! 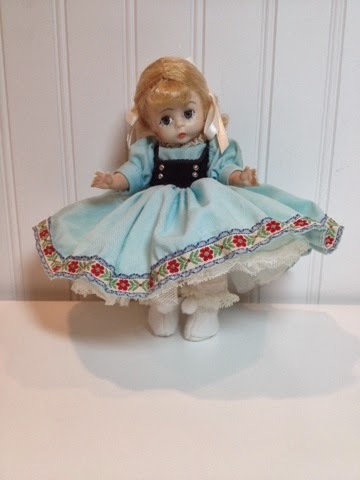 The Alexander-kins were sold in various outfits like regular dolls as Wendy or Wendy-Ann, but they also were dressed in all manner of international costumes, called "Friends from Foreign Lands" and as nursery rhyme and literary characters like the Nancy Ann Storybook dolls. Unlike Storybook dolls, the Alexanders could be dressed in different outfits and had removable accessories like shoes and bags. I think the Alexander-kins became the most collected dolls ever, just based on observation. Every little girl I knew growing up had at least a couple International 'Kins. I have owned a Miss Muffet as long as I remember. I think my mother bought it basically the minute I arrived! My mother bought me a couple of the international dolls as well, but honestly, I never liked the Alexander-kins much. The dolls of my era had the "moustache" face mold, which I always thought looked ugly and mean. 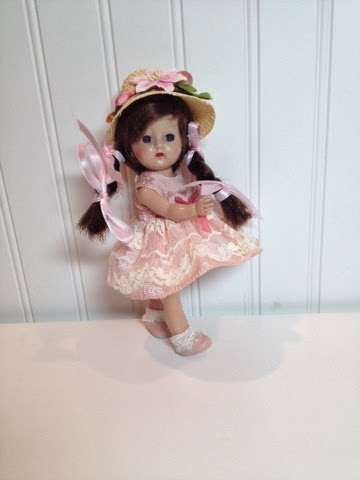 I did like the dolls' pretty dresses and jewelry and stuff, but when I was old enough to choose my own collector dolls I picked different ones. I've also never liked child dolls who are dressed as adults. I had an 80s Ginny wedding set complete with a bride and groom and tiny cake and everything. My mom was all excited when she found it, but I thought it was weird that toddler Ginny was getting married! 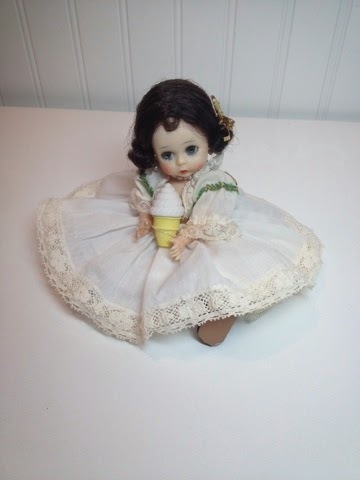 Miss Muffet was my only 8 inch doll with a cute face and so I would sneak her down to play with her when my mother wasn't looking. As a result, she lost all her accessories and is rather dirty. Of course, none of the 70s or 80s Alexander dolls are worth much of anything anyway, so I might as well have played with her! The trouble is, once a doll becomes a collector doll only, as the Alexander dolls have, they lose their value. Years from now play dolls that become popular will be the valuable dolls because the fact they are played with causes them to be scarce. Every woman my age has a collection of perfect, unplayed with, often still tagged and boxed Alexander-kins, so there are just too many for them to be worth much. I had a friend who had a ton of Alexander-kins. They were kept in their boxes and filled the entire linen closet. She was allowed to open the boxes so we could see them but she wasn't allowed to take them out. As a girl I was jealous, but now I think it's such a shame. Those dolls are worth about a quarter of their initial cost, even mint in the boxes, so she should have at least been able to hold them. 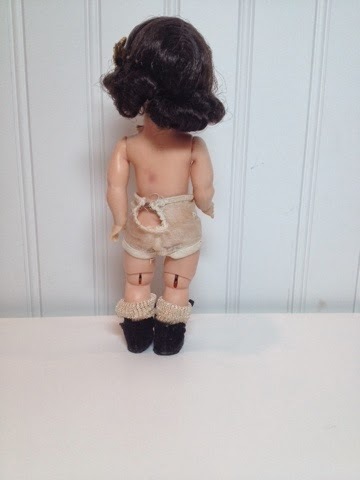 The little 1950s girl who owned this lot of dolls had no such strictures placed on her, obviously! These were playmates for sure, and they were well-enjoyed. Of course, the dolls in the lot are all 1950s-60s, before the Alexanders became considered collectibles only. Back then, I think it was rare for people to have enough money to buy "collector" dolls. My mother, at least, never had any real dolls for collecting. She had a Horsman Cindy she kept on a stand, so it survived to be passed to me, but that's the only one. This is why she was so eager to buy collector dolls for me and my sisters. 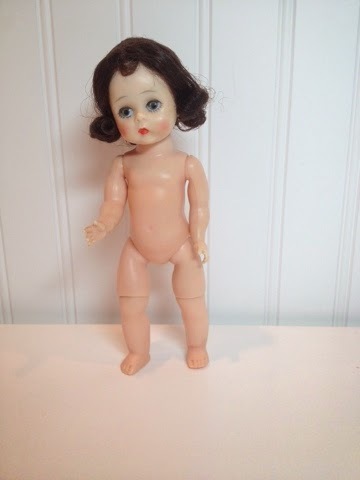 She was one of the six children of financially-challenged parents, but her friend Adele, an only child I guess, had lots of collector dolls. 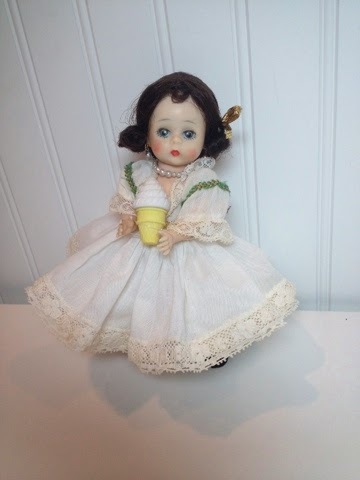 My mother was so jealous, even though I've never met Adele I can list many of the dolls she owned in the 1950s! My mom bought so many collector dolls for my niece, my sister finally asked if she could just have some dolls to play with! 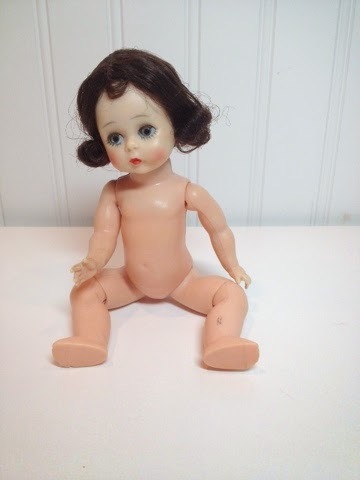 I think this is a 1960s doll. Anyway, for the most part all I know about Alexander-kins is that the 1950s ones are the only ones that are worth much unless some others are really rare. I don't know a lot about identifying them, though. My understanding is that the earliest Alexander-kins feel very heavy. The 1950s face had almond-shaped eyes and red lips. 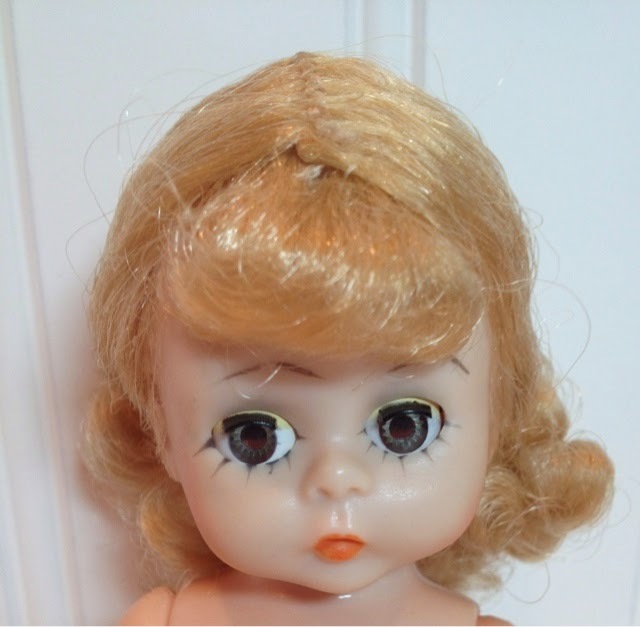 The 1960s dolls had round eyes and longer lashes I think of as "star" shaped. Their paint is more pastel. Supposedly, anyway... I found all this information on an archived blog page from a now-defunct Web site, so take it for what it's worth. Based on that blog and looking at my Patricia Smith Alexander book I believe the Girl with the Curl is from the mid to later 1960s and the Heidi is from the early 1970s. The latest item I was able to date in the lot is the Mexico dress and skirt from 1965. That doll was missing, however, or maybe it was the headless doll. These are definitely not the ugly 80s dolls, though. The other dolls in the box were all from the 1950s. 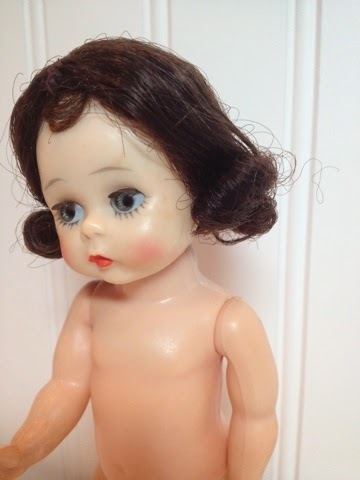 I believe this doll is from the 1960s. Besides these little Alexander-kins, I have my custom life-sized mermaid doll well underway. It's cut out and I've "painted" the face using a melted-wax technique. I'll write a how-to post specifically on that soon. I'm happy to be busy, and I'm super-excited, because I got a message from eBay inviting me to participate in a special "retro" event from April 4th-13th. Some of my items might be highlighted by eBay in advertising email and on the home page since I sell mostly vintage items! Make sure to check the event for great retro items. 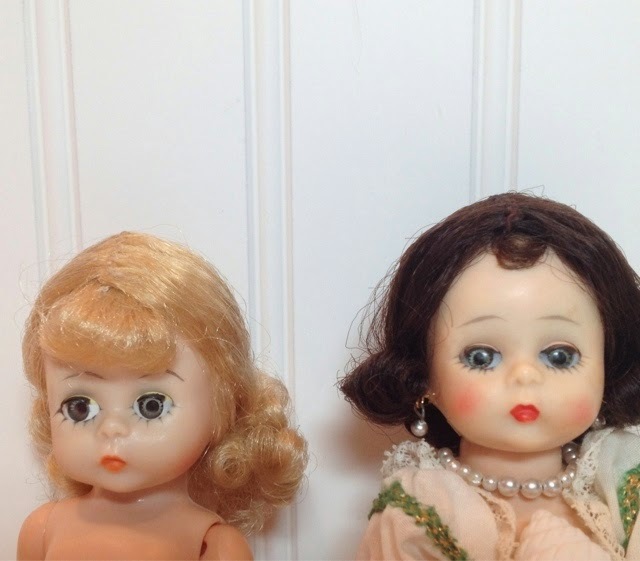 Of course, you can buy these dolls and many other vintage items in my stores any time: https://www.etsy.com/shop/AtelierMandaline and http://stores.ebay.com/atelier-mandaline. 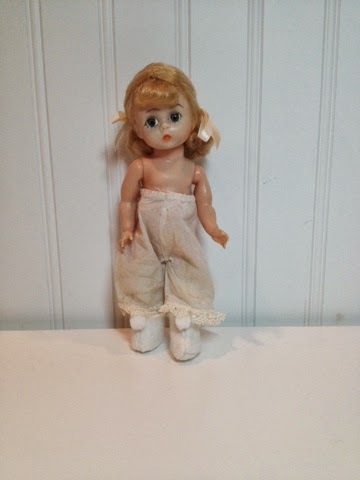 The past couple days saw me working steadily on a lot of small dolls from the 1950s. 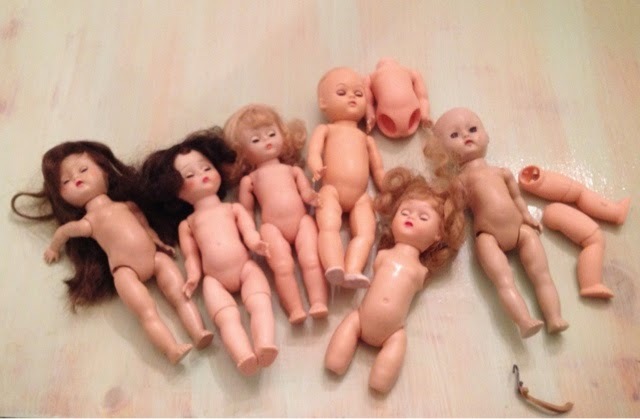 The lot, very dirty, was clearly a collection of someone's play dolls and they were well played with! A few were beyond repair or missing essential parts, like heads or legs, and I sold those as parts for restoration. 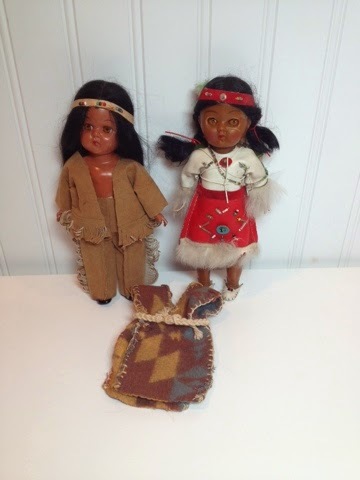 I finished the first part of the lot, the Lucy Indian doll and her friend, and wrote about that in my last post. Today I finished a lovely little Ginger doll. 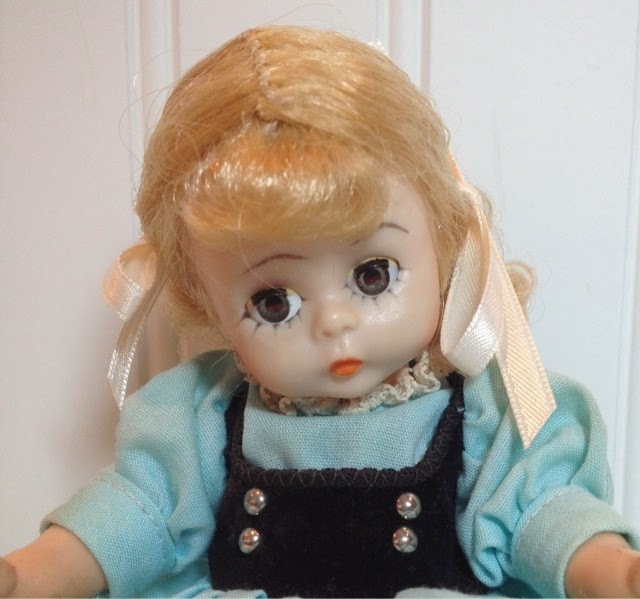 Ginger, by Cosmopolitan, has one of the cutest faces of the 50s eight inch toddler dolls, at least in my opinion. She has very round eyes. Storybook's Muffie has a similar face and there are lots of unnamed clones of these two. I've seen some Pam dolls with a Ginger type face and others with a Ginny face. So, how can you identify them? Ginger dolls are rarely marked, and their clothes have almost always lost their tags, at least when you buy them in the disheveled condition I tend to acquire. Ginger has round eyes and a dimple above her chin. Ginger started out as a toddler doll. The early Ginger has very round eyes, which have a tendency to stick open. She is made of very shiny hard plastic. Her arm hooks are C-shaped with a peg attached, sort of a combination of the Virga and Fortune arm hooks. The insides of Ginger's wrists have a circle mold mark. Ginger has a faint belly button, a dimple under her lower lip, separate detailed fingers, and dimples on her feet above her toes. 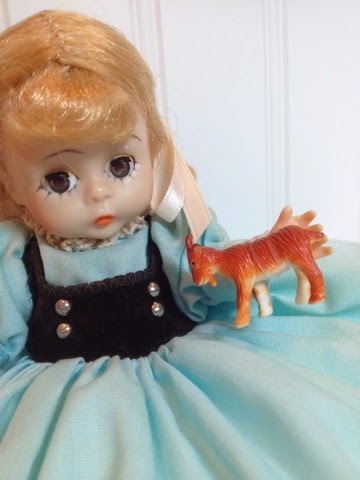 Later Gingers had vinyl faces and eventually became "Little Miss Ginger" with a teenage figure and high heel feet. By that time her face looks totally different. So the identification points above apply only to the early toddler Ginger dolls. Ginger's arm hooks and circle mold marks. This particular Ginger was dirty but otherwise unharmed. Her sapphire blue sleep eyes even work, which is unusual! She has amazingly thick, long, shiny hair. She had black glue residue all over the sides of her face, so I could see her hair had once been glued over the sides of her face. 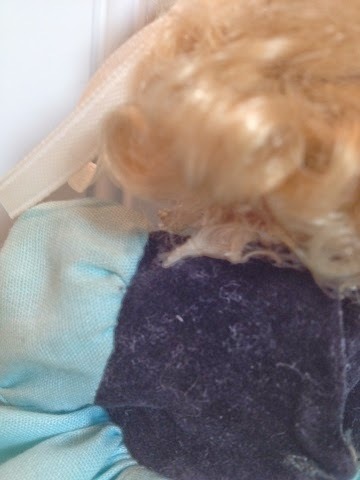 She had a tiny seam split on one shoulder and the side of her face. I repaired these and glued her hair back down over the sides of her face so the facial repair isn't visible and the shoulder is barely seen. Her arms needed re-stringing, so I did that. Ginger's hair had been styled in a ponytail long enough for a rubber band to rot into it. I had to pick the old pieces of rubber out with tweezers. I think this was styled by her little long-ago mommy, though, because I think most Gingers came with their hair rolled in a big sausage roll all around their heads. This one had such lovely hair I wanted to show it off. Instead of rolling it up I styled it in thick braids tied with ribbons. 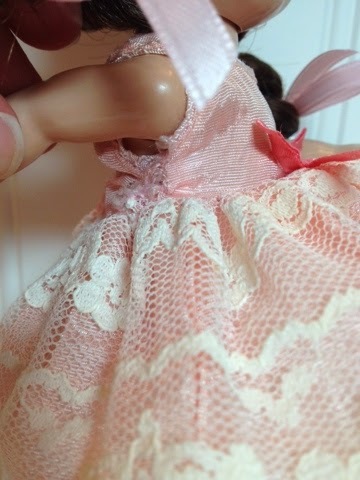 Since the toddler doll lot had a lot of clothing included I searched through it to find a dress. The dresses in the lot had all-over dirt but no stains, which is unusual. I could see they'd been washed, however. The pink dress I chose for Ginger barely fits because it shrunk in the wash. Since it was clear the clothes had previous washing I washed them in cold water and air dried them. I repaired tears to the buttonhole and side seam of the dress. The pink tricot bloomers needed new elastic. I tried to just cinch it up because tricot is so hard to sew, but they kept falling down, so I had to replace the elastic in the waist. Unfortunately this didn't work out well. My sewing machine eats tricot, even when I use a ball point needle, and it gobbled these up several times. The result is not the best waistband ever. Luckily, the skirt hides it. A while ago I bought a Vogue Ginny suitcase with a robe and nightgown inside, as well as a pair of vintage rayon socks, still pinned together and unused, a bouquet of flowers, and a pair of Betsy McCall shoes. I gave Ginger the unused socks and found some pink shoes for her. 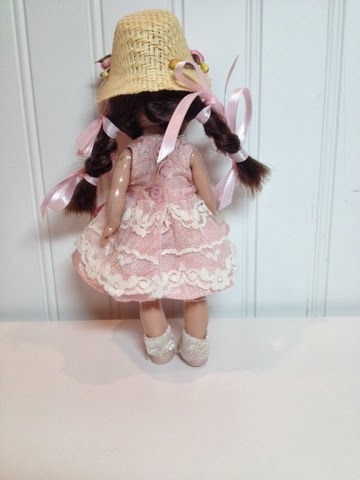 I trimmed a straw hat with vintage-look flowers to match her dress. 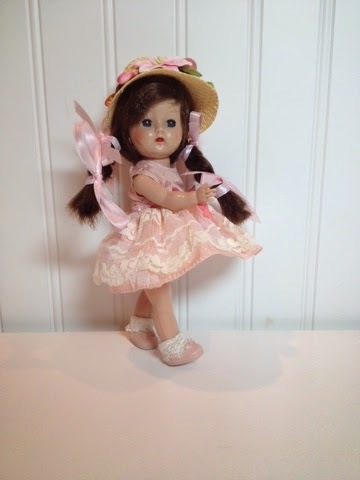 Ginger is a straight-leg walker doll. Next in line for repair from my toddler lot are the Alexander-kins. I am not sure how long that will take, however, as I have a big project to finish. One of my best clients ordered a 4 1/2 foot tall mermaid doll and I need to get it finished. I will, of course, keep posting about that doll and my other finished projects. 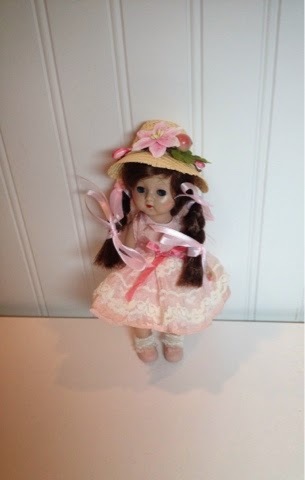 Purchase Ginger in my store and keep watching for her friends: http://stores.ebay.com/atelier-mandaline. Well, as it turns out, eating quesadillas, finishing Cissy dolls, shopping at consignment sales, and all my other ambitious weekend projects, were not the best of ideas. Yesterday, after I worked for about an hour on the custom doll commission I received, I became feverish and had to lie down for a while. Today, although I feel much better, I have been taking it as easy as possible. I did work on a lot of little projects, but only those I could complete while sitting. I went for slow walk tonight, but it was cut short when an opossum dropped out of a tree almost right on top of me and started hissing at me and acting weird. I decided it was a sign I should return home and get back to work. A little while back I bought a big, filthy lot of Alexander-Kins and Ginny-type dolls and clothes. 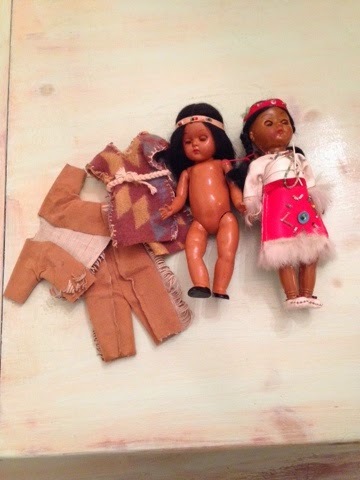 Two American Indian dolls were mixed in with the lot. In my haze of illness I glanced at them and assumed they were tourist-type dolls. I planned to clean them up a little and list them for about $20. However, when I started cleaning them I noticed one doll was much better-made than the other. 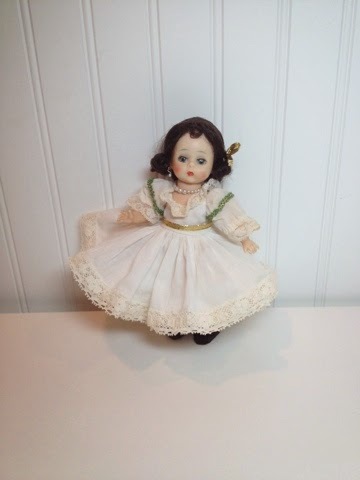 In fact, she looked just like a Virga Lucy doll. I wondered if Virga ever made Lucy as a Native American. I knew Fortune made a Pam doll as a hula dancer and that doll is worth a lot more than the regular Pam dolls. 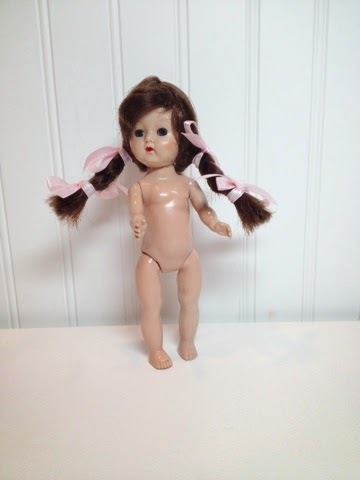 I decided to look the doll up before I listed it, and I'm glad I did! 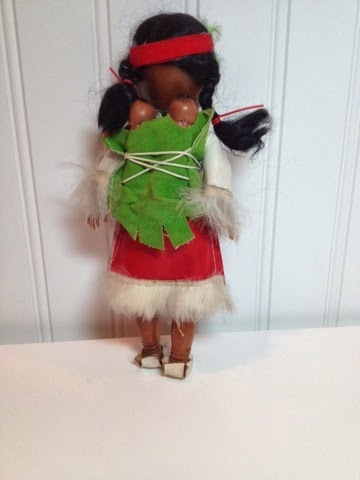 It turns out Virga did make various ethnic dolls, as did Vogue and Fortune, using their Lucy, Ginny, and Pam molds. All these, if from the 1950s, are extremely rare and valuable. 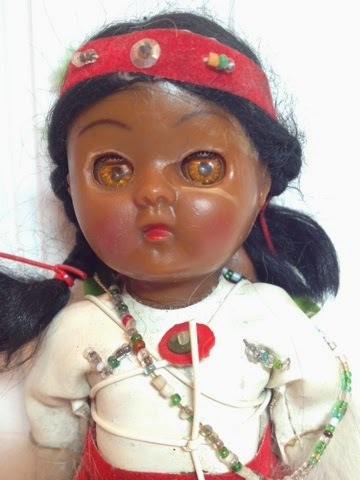 Searching the Internet and eBay brought up only one other 1950s Indian Lucy. Lucy, Pam, Ginger, and the other Ginny clone dolls are difficult to identify. 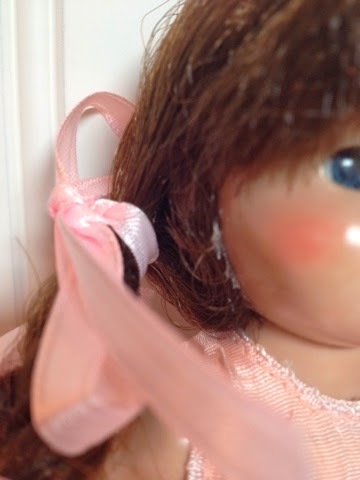 Ginny dolls are always marked, but many of her clones are not. Once a clone doll became popular other companies would make even cheaper clones of the clones. Some were advertising premiums. Sometimes the face and body molds were changed dramatically while using the same name. Lucy dolls have C-shaped arms hooks and fused third and fourth fingers. 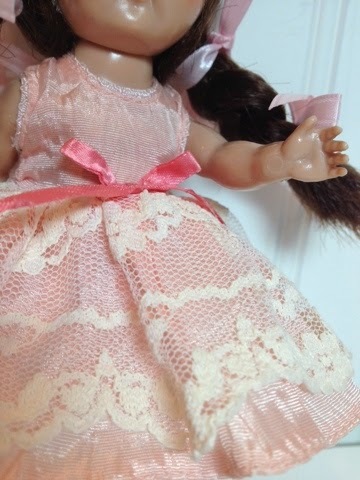 Lucy dolls, though their faces are nearly identical to Ginny and to some Pam dolls, can be identified by their arm hooks and hands. The Lucy arm hook is shaped like a C. Her third and fourth fingers are fused. The shoulder split, before and after repair. Lucy needed re-stringing and she had a shoulder split. 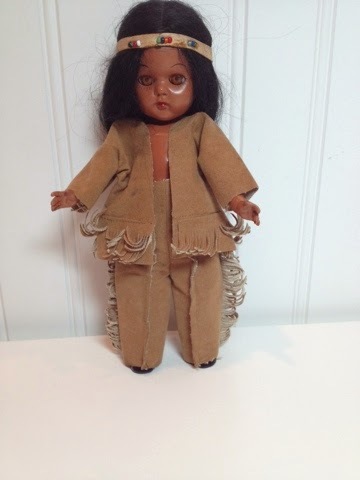 I made these repairs and cleaned the wool blanket dress the doll originally wore. 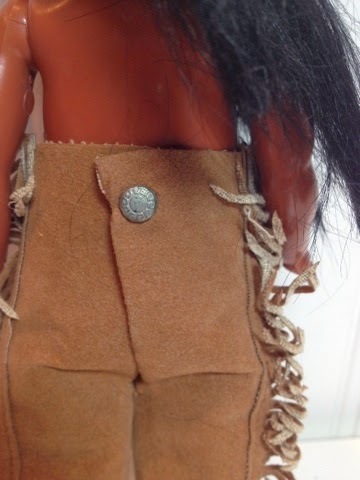 I found another outfit, faux "buckskins", in the clothing lot. I think these may have been originally made for Ginny or Ginger, but they are perfect for the Indian Lucy. She can wear the shirt open and do a little gender-bending to become a brave. This outfit may have been made for Ginger or Ginny. 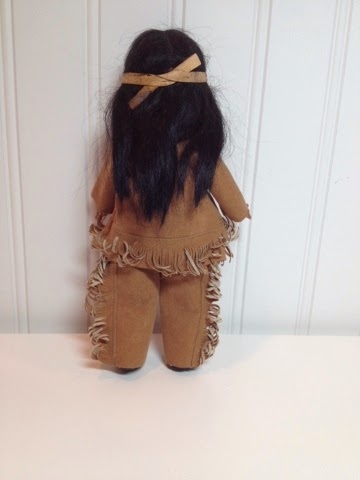 The other Indian doll really is a tourist doll, and the doll is very cheaply and poorly made. Her costume is amazing, though. 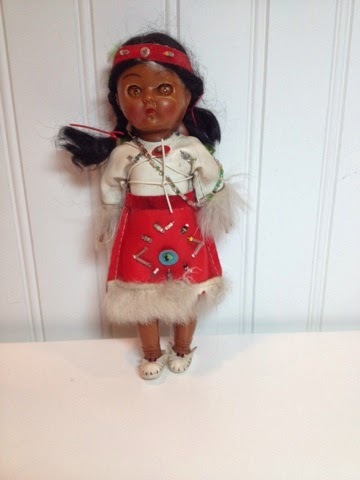 Her dress is embellished all over with beads and trimmed with real fur. She carries twin babies, papooses, on her back. She even has tiny beaded moccasins. I combined all these as a lot, because I thought if someone didn't want the tourist doll they might want to use the clothes for rare, valuable Lucy. I might have removed the clothes myself, but I felt bad doing that to the tourist doll. I always wanted one of those when we went to Michigan in the summers, even though the 1970s ones were far less impressive, but my mom would never let me have one! I will be listing many more little 8-inch dolls from this lot as I finish them, slowly, since I'm trying to preserve my recovery. Make sure to check my store for those: http://stores.ebay.com/atelier-mandaline. These dolls are the same size to share clothes.